Microsoft has penned a blog post on how it leveraged Artificial Intelligence (AI) to roll out the latest Windows feature update. It says this is the first time that it has leveraged AI at scale for this purpose, and it saw evidence that it has "greatly improved the quality and reliability of the Windows 10 April 2018 Update roll out". For example, with the latest update, there are higher satisfaction numbers, fewer known issues, and lower support call volumes compared to previous Windows 10 releases. Explaining how the AI got on with its roll out task, Microsoft said that it "intelligently selects devices that our feedback data indicate would have a great update experience and offers the April 2018 Update to these devices first". Then, as the roll out progressed, data was continually added about the experience of outlying computer configurations, and based on that, roll out to similar PCs was accelerated or decelerated. Subsequently Microsoft engineers work to address the flagged compatibility and similar issues that the AI picks up. Microsoft says that the overall goal the AI was set was for a safe and reliable update. Overall it is claimed that the AI lets Microsoft rollout fast, and responsibly, with minimum issues, as wrinkles can quickly be spotted and then the AI adjusts the roll out strategy. "The April 2018 Update is officially the fastest version of Windows 10 to reach 250 million devices, achieving that mark in less than half the time it took the Fall Creators Update," boasts Microsoft. Microsoft undertook an AI pilot programme during the Windows 10 Fall Creators Update roll out and this limited trial gave the firm the confidence to develop and expand the AI powered rollout at the end of April 2018. Looking back through HEXUS reports, the Windows 10 April Update did have some newsworthy issues. Most notable were the problems faced by PC owners packing Intel and Toshiba SSDs. Microsoft had addressed these problems by the last week of May. 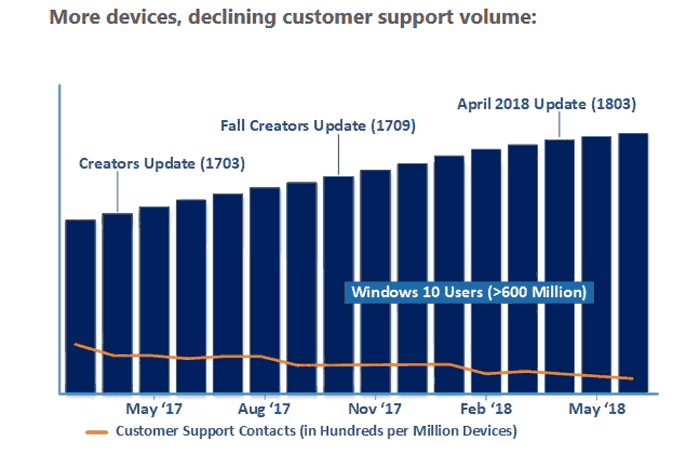 with the latest update, there are higher satisfaction numbers, fewer known issues, and lower support call volumes compared to previous Windows 10 releases. But fewer issue, means lower support call volumes and higher satisfaction numbers, I'm not quite sure how AI is a major factor in that, they don't say anything about the AI writing the code or bug fixing or even QA testing. Reading more into it, looks like they use the AI to regulate who gets the update when, targeting people with the least potential issues (or least likely to complain) first to give the coders more time to focus on bug fixes. Also as the general trend of support calls in that graph is downward, I suspect that removing AI from the equation would of had little difference and what it did potentially do was to boost early numbers for the roll out. Well the numlock, capslock and scroll-lock lights still don't work! That seems harsh. It shouldn't be hard for MS to eg monitor that a box has taken the update and then not checked back in afterwards implying they bricked it. But filtering through the sheer quantity of data that MS has and making sense of it is an ideal job for an AI to do. I'm normally pretty anti-Microsoft, but I have to say well done on this one it is an interesting tool in the face of an untestable platform thanks to all the various cards out there. Now if they could un-mess my local garage's networking so they can bill customers, that would be nice too. Sounds like the removal of home networking stuffed what was a working setup. When I initially installed Win10 I had issues with the onboard audio cutting out which were fixed,and now this updated has brought that bug back so I need to use my DAC and headphone amp,for normal usage. So far this update has been meh for me!